And just like that, I finally mastered a roasted rack of lamb. For whatever reason, I have feared cooking a whole rack of lamb for the longest time. Before this recipe I’d cooked up a grand total of four racks of lamb, and only one with success. I don’t know if I was buying bad meat or what, but my lamb just never turned out all that awesome. When we had a billion and one people in town over Christmas (hey, hey Gerard and Payne families…all of you dear friends…and even the “randoms” who stopped in), we all got to chatting and everyone decided it was very wrong that I did not have a recipe for roasted lamb on the site. I guess they all really love them some lamb… and so they went on to convince me to make them lamb tacos (with all the fixings), which I must say were really freaking delicious. 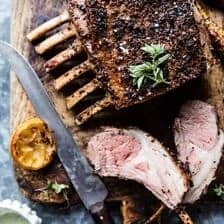 I decided right then and there that I would make you guys a roasted rack of lamb as the centerpiece of your Easter menu. And you guys, this is not just any rack of lamb, it’s one that I LOVE! <–obviously, or I wouldn’t be sharing it. DUH. After talking with all my people, aka Lyndsie, it was decided that the lamb needed to be simple. Simple so that the tender meat could really shine, and so that I could serve it up with a sauce…because you guys know I love a good sauce. SO…the lamb is seasoned very simply with a few very important ingredients, garlic, oregano, cumin, lemon, crushed red pepper flakes, salt and pepper. The key is to really let the seasonings sit on the lamb for a bit before it roasts. I’ve been doing thirty minutes on the counter, but overnight is best,,,if you can plan ahead a bit (I try, but in the end, something comes up and ahhh, the overnight thing just doesn’t happen). Then all you need to do is roast, so simple, so good. I think before I was just putting too much on the lamb and it overpowered everything. Just another example of how simple can be so awesome. Another key here is to roast the lamb at a higher temp so that you can get a nice crust on the outside, while leaving the inside perfectly cooked. I went for medium-rare, but if you prefer your lamb more well done, just tack on a few minutes to the cooking time. But okok, while the lamb is great on its own, you know me, I had to add a topping of sorts. I thought about this for a while, going back and forth between a white sauce, an olive oil based sauce, even a salsa, but something creamy just seemed to fit best here. Enter the goat cheese sauce! Oh my gosh, this sauce is incredible. Basically whipped goat cheese with a touch of honey and fresh basil <–all my favs. I absolutely love this sauce and how well the flavors pair with the simple roasted lamb. The honey adds a really nice warmth, while the basil keeps the sauce bright and fresh. The combo together is perfect on the tender lamb, and while I used basil, you could also use mint. I have to say, I’m pretty happy with the fact that I now have a go-to lamb recipe. YES! This roast feels so perfect for spring in general, but would of course be amazing for Easter. Ok, and just about any other time of the year too! Now that I have the rack of lamb pretty much perfected, maybe it’s about time I show you guys those lamb tacos? Cinco de Mayo is coming up, so my thoughts are tacos all the way. Yay? Nah? In the meantime, I’ll just be over here, roasting up racks of lamb and covering them in goat cheese sauce, because this recipe is that good. I know for sure I’ll be making this lamb at least once more…not all of the family will be here for Easter, but most of them will be, and this lamb will certainly be on the menu! ps. speaking of goat cheese, we have so much goat milk it’s not even funny. I have yet to make homemade goat cheese and I feel as though this needs to happen ASAP. Has anyone ever made goat cheese? Roasted Rack of Lamb with Basil Honey Goat Cheese Sauce. The rack of lamb comes alive with the sweet sauce! 4. Roast the lamb for for 15 minutes, then flip and roast another 10 minutes for medium-rare. Remove and let stand 10 minutes before slicing. Tomorrow we we’ll be talking sides, and I am excited! 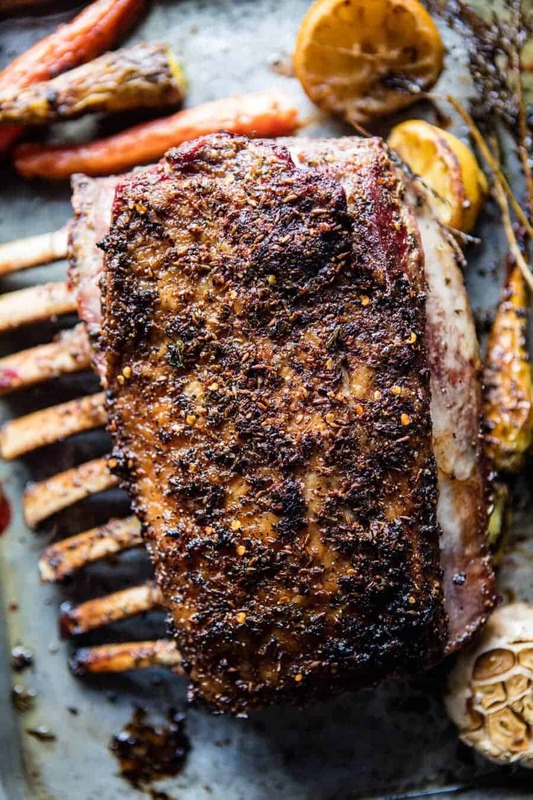 This is a beautiful and mouthwatering roasted rack of lamb. Lamb is my favorite meat! Its so good, especially when you don’t eat it too often! So happy you like it Carlos, thank you! This looks incredible. We’ve been trying to treat ourselves to a slightly pricier cut of meat once a month and a rack of lamb has been on the list for a while. I think I might have to move it to the top so I can have a go at this recipe this month! Yes!! I hope you go for it! Please let me know how it goes Amy! I love lamb, this is perfect for Easter lunch! Ah yes! So perfect, I hope you love it Ruth! I have never eaten lamb. We have a friend that says she can’t stand mutton. Which I was told mutton and lamb were the same thing. Then I saw or read that there is a difference. So maybe that is why some of yours didn’t taste exactly to your liking. Mutton is an older sheep. The meat is stronger and tougher. There definitely is a big difference. It’s the same animal, just different ages. Sorta like beef and veal if you think of it that way (but I’d take beef over mutton any day!). That is bang on Natasha. A lamb is newborn to 1 year, mutton is 1-2 years and a hoggett is anything 2 years and above. Stay away from hoggett. Definitely not for the faint hearted! Hmm, I am not sure, but I am looking it up now! I mutton is just a different aged lamb, but I am not sure. Hope you have a great weekend! This looks delicious and I hate lamb, lol. Will be trying this for Easter. THANK YOU! Yay, I hope you love it Rose! Thank you! Definitely YES on the lamb tacos! I was going to ask for the recipe before I even read you were thinking of doing it. 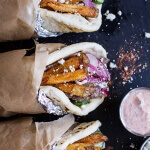 Is it mediterranean-ish with tatziki like souvlaki? 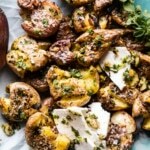 I have a recipe for goat cheese potatoes that is very high in calories, so this may be a better way to get my goat cheese fix with lamb! but umm….those potatoes sound amazing! Love this recipe Tieghan! It does take some practice to get a large joint of meat to cook how you want it to. Looks like the 4 times before this one really paid off! Gorgeous! And pinned… obviously! Yes it does! Thanks so much! Practice helped a lot! This looks like heaven on a plate!!!!! I just saved this on Pinterest and will be trying! 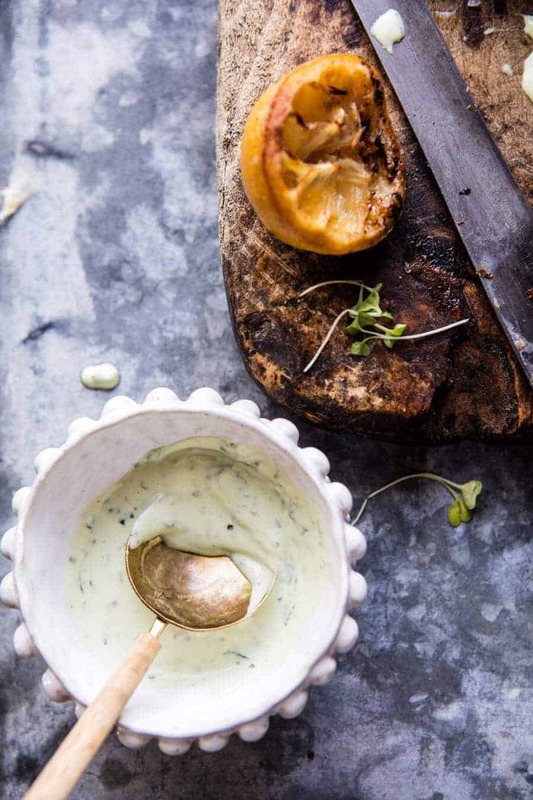 That basil and goat cheese sauce sounds amazing! Awh, thank you so much Sara! Congrats on conquering the lamb, girl and it looks epic! It wasn’t easy! So thank you, hope you can try it Tori! Thanks Laura, basil sauce is BOMB! 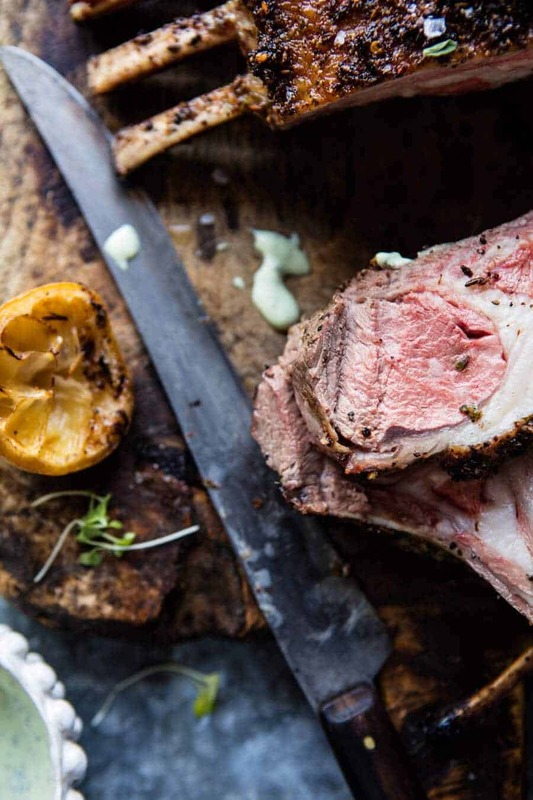 Fabby Fabby Lamb – just the most special thing to serve for special Spring dinner ….or when you can get that great lamb. So liking your sauce action as well…oooo goat cheese…yah! Typically, make tzatizki sauce and sometime will toss in feta, and definitely fresh dill, if in season. Be fun to try the alternate..nom nom. Lea & Perrins Worcestershire sauce..it is amazing on grilled lamb! Do give it a whirl! I totally agrre such a delicious dish! The tzatizki is always so good! The Worcestershire seasoning sounds amazing! I will! Thanks Tammy! 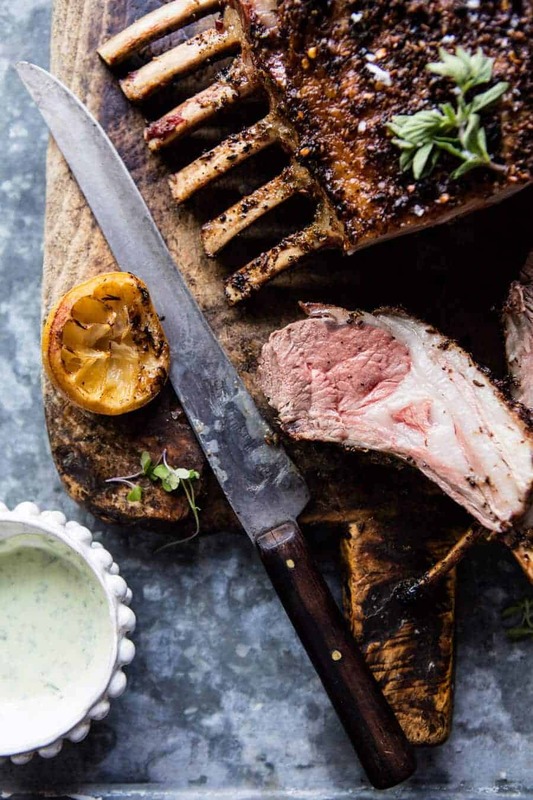 That Honey Goat Cheese Sauce <3 <3 <3 Maybe it's time I need to master the rack of lamb too! I think its time!! Haha! I had that same fear until I did it and honestly, it wasn’t hard at all! 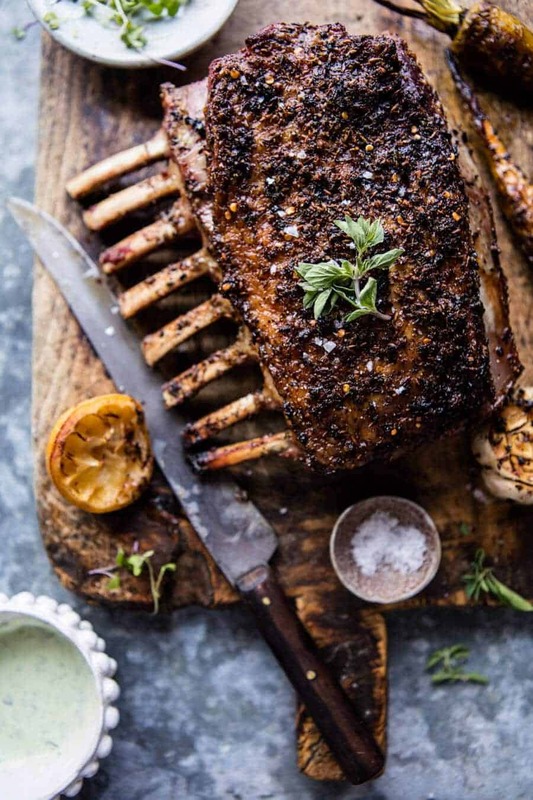 I love how a rack of lamb is a total show stopper of a dish and this one definitely fits the bill! Such a showstopper! So fun too! Oh I LOVE when you do meat posts. This rack of lamb looks like it’s falling off the bone! Ah yes! Me too, thanks so much Sarah! Well, I’d say you’ve definitely mastered it Tieghan! And that honey goat cheese sauce sounds amazing! Awh, (: Thanks so much Mary Ann! 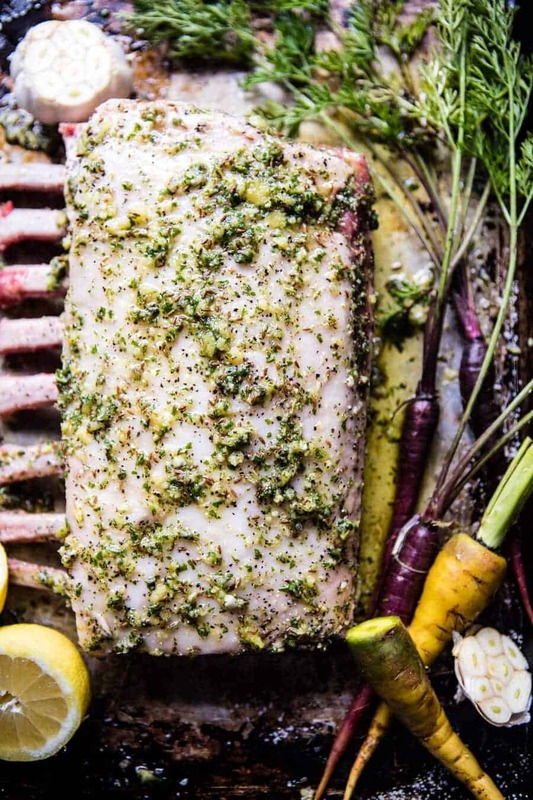 This is the most beautiful rack of lamb EVER! Wow! Stunning! Awh, your too nice Alice! So happy you like them though! I love lamb so much and it’s never looked so mouth-watering good! Good job on finally getting lamb down! I’m intimidated by large meat items too, because it’s especially sad when you mess it up! Eventually you learn, though 🙂 Also, my last name, Gigot, means ‘leg of lamb’ in French… sooooo I guess that means I have to make this 😉 Looks so delicious, Tieghan! Its intimidating making that large of meats! Haha, I agree that must mean you have to make it!! So cool! Hope you love it Tera! I am playing catch-up so I am a few days late in commenting on this post. 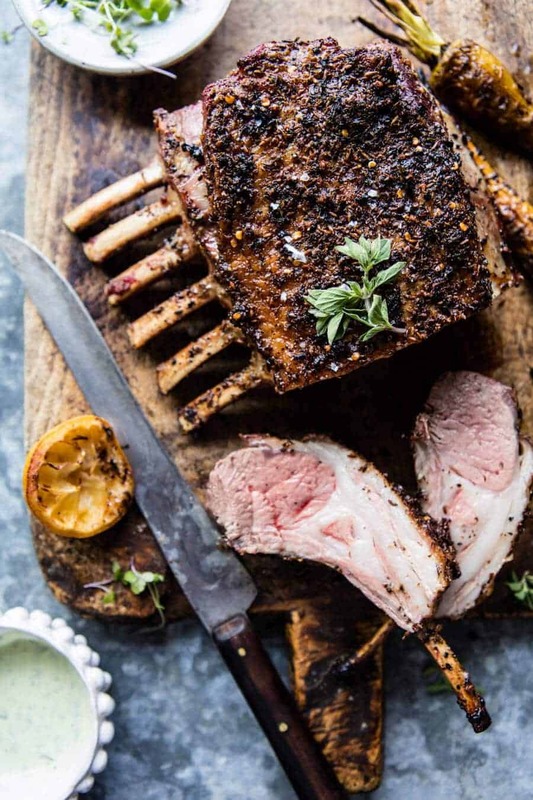 I too have been wanting to tackle a roasted rack of lamb, but had not found a recipe that sounded great (as most include a mint sauce which brings back awful childhood memories – but that is a story for another day!). Anyway — Enter this recipe! Hallelujah!! So excited to try this with the heavenly sounding goat cheese sauce!! Thanks for always, always putting out brilliant recipes and gorgeous photos, Tieghan! Late or not, so happy you like the lamb and are going to try it Leah! I really appreciate all the kind words, and hope you love it! Cooked this last night, beautiful recipe – the sauce is insane! SO happy you liked it Jerome! Thank you! Im so so happy it was good, thank you for making it Megan! This looks amazing and I’d love to make it, but I’m wondering, could you do this same thing with a fresh pork roast. Love your creative recipes! I made this and I think it’s pushed aside Thomas Keller’s rack of lamb as a favorite for my family. When we’re being cheap, we use the sauce and seasoning on lamb loin chops. I will say I followed the cooking times exactly (in two different ovens) and each time I ended up having to sear the lamb at the end to cook it enough to med-rare. It just doesn’t seem to cook through in the oven or get that nice brown crust and I was afraid leaving it in for more time would overcook. This time I’m going to try to sear it quickly before roasting. 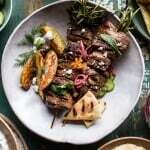 Excellent lamb recipe. Easy to make. The goat cheese sauce was a perfect accompaniment. Thanks for sharing. PS. Hope you LOVE the book! Ok half baked, this looks awesome and I’ll be making it for Easter. BUT!! Lol there are Carrots in the list of ingredients but not mentioned in the body of the recipe. Can’t wait to eat THIS!! Love lamb and goat cheese!!!! hi Gloria! The carrots are added in step 2! I hope you love this! Dear heavens, trim some of that fat off before you start cooking!! It wasn’t even cooked following your directions! Not good. Hi Janet! I am so sorry that you had trouble with this recipe. Is there any questions I could help you with? Please let me know! Thanks! We made this yesterday for Easter and it was beyond delicious!! The lamb was cooked to perfection, medium rare, and the goat cheese spread was as delicious on the lamb as it was on the vegetables!! This must be one of the best lamb dishes we have had yet. It was extremely easy and the flavors melted in our mouths! 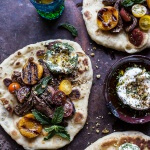 Thank you for sharing this delicious lamb recipe as it is now our favorite for lamb. I am so happy to hear that Lee! Thank you! I hope you had a wonderful Easter! You put the seasoning on the fat size, cook for 10 min with the fat side up and bones down and then flip it over so the bone side is up? Is there a good reason to flip it over when it’s being cooked in the oven? I made this for Valentine’s day and it was so delicious and easy to make. This was the first time I made lamb too. Thank you again for another amazing recipe! It looks like you’ve roasted it with the goat cheese sauce on it already….but the instructions don’t say to do so. Can you clarify if the goat cheese sauce is applied before or after roasting?